I have read/heard a lot of really great things about Ernest Cline's previous book Ready Player One. The book’s storyline sounded like something I would enjoy and is still sitting on my never ending TBR list. When Random House Canada gave me the opportunity review a copy of Armada, I was super excited. Similar to the main character, my childhood was filled with memories of videogames, sci-fi movies and action figures. This is likely why I was able to easily connect to Zack and his journey to save the human race. There are an abundance of pop culture references, which I LOVED. They are often used to explain/help visualize the characters’ actions and reactions or to describe settings. Some readers may not enjoy the book as much if they don't pick up on them. But, if you do, it makes Armada that much more amazing. 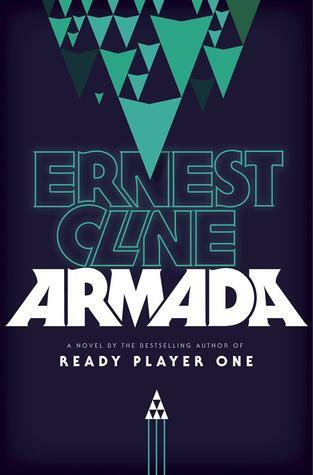 Overall, I found Armada to be a fast paced and thrilling coming of age story. It was really hard to put down and now that I’m done, I can’t stop raving about it. Armada is the perfect read for gamers, geeks and anyone in between who appreciates a down and dirty alien apocalypse. Hi! Just wanted to let you know that I gave you an award because your blog is amazing! Please if you could check my site out for the info about the award (Sisterhood of the World Bloggers award) that would be amesome. It's teaandagoodread.wordpress.com. Thanks! I don't know whether or not I will be able to read this book. Nevertheless, I would like to thank you for the shared review. It's helpful for certain individuals who judge and evaluate from someone's reviews.